Getting a podiatric residency place will be very important for your future, but being selected for the right one is not easy. You are going to be competing against many others for a place and they will all have excellent qualifications much like yourself to have reached this far in their career. Because of this, your CASPR CRIP personal statement will often be the most important part of your application as it is your opportunity to really sell yourself to get the CRIP interview. This needs to capable of making you stand out from the other applicants and to make you memorable to the committee that will review your application. Writing a personal statement for medical school to a standard that is going to get you noticed however is not an easy task and many applicants will really struggle. This is a big opportunity as you can use our specialized personal statement writers to provide you with the support that you will need to get your name recognized. CASPR is the Central Application Service for Podiatric Residencies which is run through the American Association of Colleges of Podiatric Medicine (AACPM). This is the route through which you will upload all of your application requirements and select the specific programs that you wish to apply to. These programs will then review your application and if they are impressed they will then invite you through CRIP the Centralized Residency Interview Program to attend an interview. You should also check each program that you are applying to in case they have a requirement for additional information. Providing help with your residency personal statement is not something that can be done by just anyone. They must fully understand the field of podiatry and also the application requirements if they are going to provide effective support. This is why our services offer you a real advantage over many of our competitors. To be sure your AACPMAS personal statement is the highest quality use our tips for writing it. 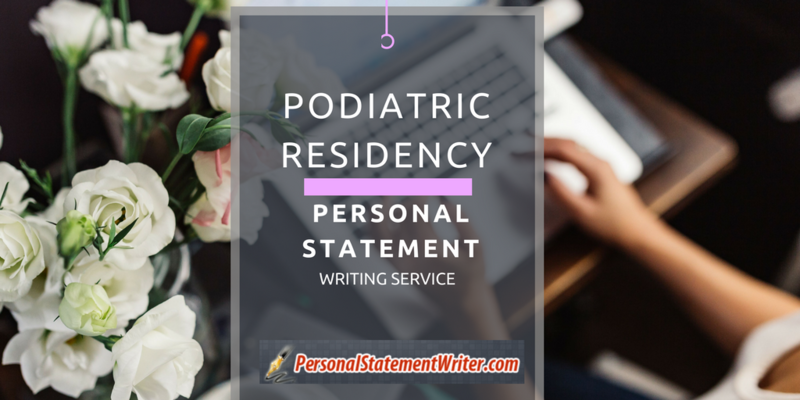 A personal statement for a residency is not something that you can just find and copy online. Nor will you just be able to fill out a few blanks on a template to generate one. It needs to be written in a very engaging way and must clearly reflect you and your aims for the future. To achieve this our experts work with you one on one to do the writing. This ensures that they can access the information that will be required to match you carefully to what the committee wants to know about you. All of the writing is done to a high standard using your information from scratch. Should you want any changes to the document our experts offer unlimited revisions and will work with you until you are confident that your statement is ready for submission. We offer support for all of your requirements from your personal statement and resume through to letters of recommendation. Our writing and editing help is always offered through truly qualified experts in the field of podiatry who work with you to ensure that you will always be able to make an effective submission. All work will be put through careful proofreading and also fully tested for plagiarism before it is delivered to you within the agreed timeframe. We also provide you with a full satisfaction money back guarantee to protect you at all times. So if you want to gain an edge over your competition just contact our CASPR CRIP personal statement writers here today for affordable and reliable support.